The Three Marks of Existence are an essential Buddhist teaching regarding the nature of experience. A basic teaching of Buddhism, the Three Marks of Existence are three characteristics that all conditioned phenomena share. This means that every sensation, thought, and experience we have is subject to these three marks. An example of a non-conditioned phenomena in Buddhism is full enlightenment or nibbana (Pali – nirvana). 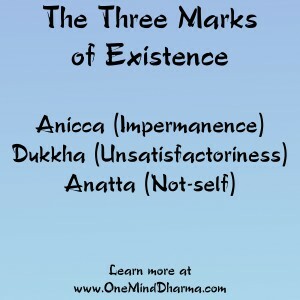 The Three Marks of Existence are anicca, dukkha, and anattā, or impermanence, unsatisfactoriness, and not-self. We grow to know these characteristics through meditation practice, especially with the practice of the Four Foundations of Mindfulness. All three of these marks may be hard to grasp or even agree with at first, and that is okay. We may even find ourselves aversive to the idea of them. Through meditation practice, we gradually come to know these characteristics. The first of the Three Marks of Existence is anicca. Anicca is a Pali word that literally means inconstant or not continuous. The Buddha’s teaching of impermanence points toward the natural changing nature of everything. Nothing we experience is constant and unchanging. Whether it is a sound, physical sensation, thought, emotion, or something external, everything changes. This paragraph may seem redundant in its mentioning of change. It’s because it really is that important and simple: everything is changing. Take the body, for example. It is constantly changing. Almost every cell in the body regenerates after a period, meaning that body your have today is not the same body you had ten years ago. Or, you may take a feeling of love you have for somebody. Whether it is a child, a parent, a friend, a pet, or a significant other, you may love another being deeply. Although your love may not wane, it changes. How you loved this being a year ago is not the same way in which you love the being today. The quality of the love changes. The feeling, thought patterns, and physical sensations change. When we look at any of our experience we can see it changing, sometimes subtly. Maybe we have chronic pain in meditation practice. Tuning in to the experience, we see that the pain may have a natural moving quality. When we move or shift positions, the pain changes. This doesn’t mean the pain necessarily goes away, but the intricacies of the experience change. It’s easy to see how some things change, while it is difficult to see how other phenomena are impermanent. One helpful practice is to bring to mind something we consider permanent or unchanging and challenge ourselves to find the impermanence in it. In meditation, we don’t necessarily need to look directly for impermanence; if we are truly mindful, the impermanent nature becomes clear. The second of the Three Marks of Existence is dukkha. Dukkha is most commonly translated into English as “suffering,” but “unsatisfactoriness,” “dis-ease,” or “stress” may convey the meaning of dukkha more accurately. Dukkha, in a general sense, is the natural discomfort we all experience in life. It may come in many forms: anxiety, regret, anger, grief, sadness, clinging, and many more. We experience the pain of loss, the pain of craving more, and the simple pain of living. There is a shared experience of dis-ease. Although we just offered several different translations of the Pali word dukkha, it may just be best to abandon any English word. When we translate dukkha, we lose some if its meaning, and it may create confusion about the principle. As one of the Three Marks of Existence, dukkha is the idea that nothing we experience outside nibbana causes lasting satisfaction. This is easiest to see with the unpleasant experiences we have. When we have pain, hear a sound that we find unpleasant, or find ourselves thinking unpleasant thoughts, we can see that these experiences are not creating happiness. Furthermore, the aversion that arises in response to these stimuli are dukkha. With neutral experiences, it is similarly easy. The neutral sensations don’t create happiness, and the reaction of boredom, confusion, or even aversion certainly aren’t sukkha (the opposite of dukkha). Where many people run into problems with this idea is with the pleasant experiences. How is joy, love, or sitting with our favorite meditation teacher dukkha? It’s a point of contention amongst many beginners to Buddhist meditation. We must understand that dukkha is NOT suffering in the way that we often use the word suffering in English. Rather, dukkha here is the simple fact that these experiences do not create ultimate freedom. Because everything is impermanent, the joy, love, and meditation with our favorite teacher eventually end. When the joy leaves us, we may actually suffer. We may be able to enjoy experience as it is, and let it go when it leaves. The point is that it is transient. It is not a cause of lasting sukkha. This doesn’t mean we should shun pleasant experiences; it’s perfectly healthy to rejoice in the joy we experience. When we see the nature of experience as just phenomena occurring, we are able to see the dukkha in it. As with impermanence, you may challenge yourself to find something that is not dukkha. Having something in mind, try to see if you can see any dukkha surrounding the phenomenon. 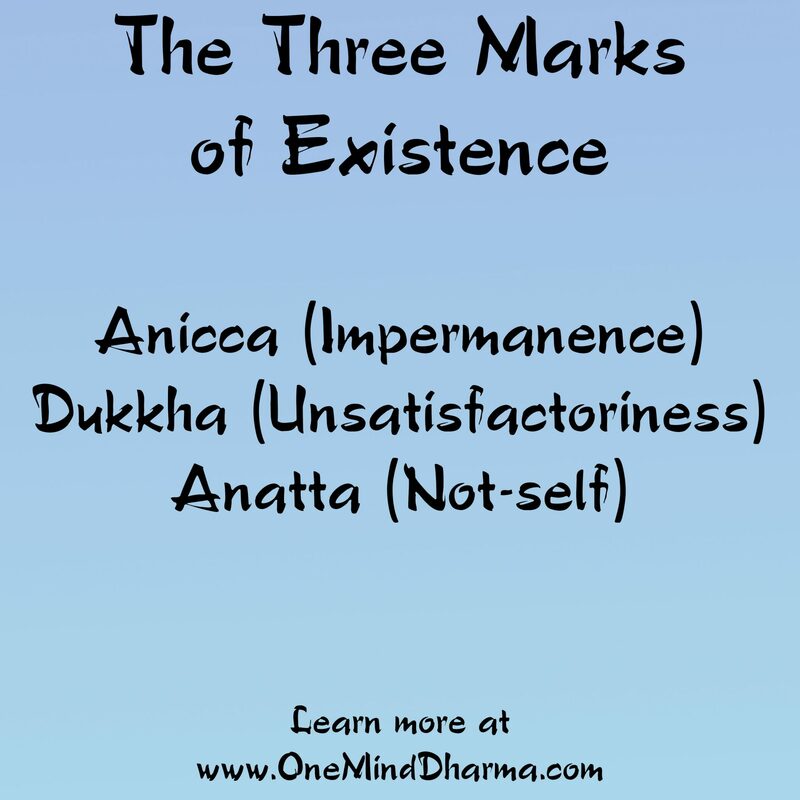 The final of the Three Marks of Existence, anattā, is at the center of much confusion and debate. Often translated as “no-self,” people get the impression that the Buddha taught there is no self. There is no you reading this, and there is no me writing it. However, that is not what anattā means. Gil Fronsdal often points out that Anattā is more appropriately understood as “not-self.” It’s just a one letter difference, but an important one. The teaching here is not that there is no self; it is that experience is not self. So what does this mean? Let’s start with the sensation of your feet on the ground. We can see the anattā in this experience by looking closely at what is happening. We may not be aware of this always, but it happens quite often. The foot is in contact with the ground, and the sensation reaches the brain. The mind sees it as pleasant, unpleasant, or neutral. The mind has a response or reaction (clinging, boredom, aversion, etc.). By itself, the sensation of the foot on the ground is nothing. It cannot exist by itself. It is a process, dependent upon the mind, the ground, the foot, feeling tone, and much more. So anattā may be understood as: no phenomena exists inherently by itself. The same may be said for sounds, emotions, thoughts, tastes, and smells. They lack an inherent self; they are processes dependent upon other processes. Next, we can consider a physical object. Let’s take a wooden coffee table. When we look or feel, we sense a coffee table. Anattā here isn’t that the table doesn’t exist. Rather, it is that the table is dependent upon so many things, it is only our perception of it as a table that makes it a table. Think of everything that had to happen to bring that table to fruition. A tree had to grow, it had to receive sun and water, somebody had to cut it down, it had to be shipped somewhere to be made into a table, it was cut and assembled, somebody shipped it to a store, and you walked in and bought the table with money you earned from working. If we went more in depth, we would see an infinite number of causes and conditions for the table to be present. When we look at the table we see all of the effort, time, and different materials used to make it. By itself, it is a combination of these causes and conditions. Once we perceive it as a table, it becomes a table. Finally, let’s consider our own being. When we look at ourselves, we can disassemble our experience. The mind is similar to a mirror, just reflecting whatever experience is occurring. Think of a mirror sitting in a hallway, and numerous people walking past it. The mirror stays a mirror, but its content changes. Every moment a new person walks by it and a new image is reflected. It is similar with the mind. We hear a noise or have a thought, and the composition of the mind changes. You may notice this by simply closing your eyes and noticing the thoughts that arise. Our own experience is a process, this is the key. We are not stable beings. We are ever-changing processes, with the mind reflecting what is occurring. Anattā is often the most confusing of the Three Marks of Existence, and this may be the case for you as you read this. It’s okay. Keep it as a working hypothesis. Be aware of this teaching, and be open to seeing it in your practice. If nothing else, it may help to keep in mind that experience is a process. In the Satipatthana Sutta, the Buddha’s discourse on establishing mindfulness, the Buddha directly instructs us to know these three characteristics in mindfulness meditation practice. This is actually the purpose of mindfulness meditation in Buddhism. This is done through various forms of meditation practice, but is of great importance in many Buddhist traditions.